Do you need a quick yet unusual soup to help you get through the end of winter? 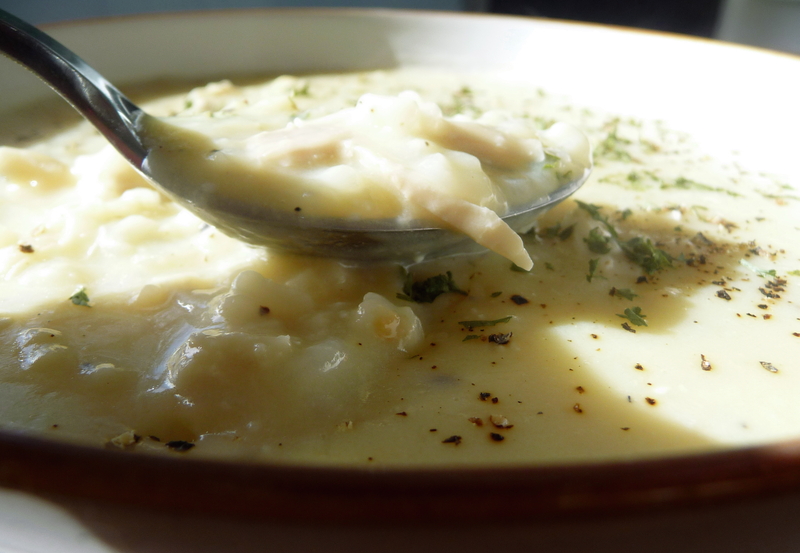 Avgolemeno soup, in my abbreviated version, is bright, creamy, and healthful. It is thick and rich, yet relatively low-fat and easy to make. This is one of my favourite soups to make during the winter for its simplicity and ingredients, which I regularly stock. 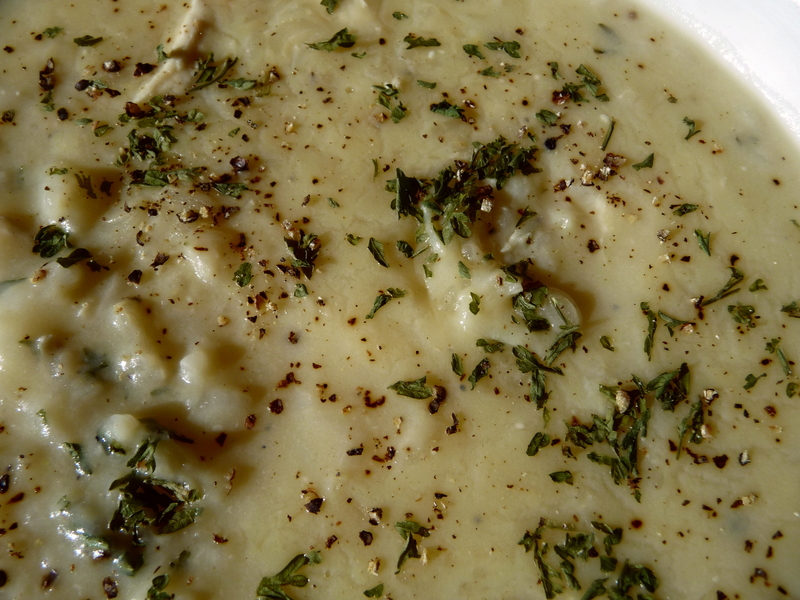 Avgolemono soup is a traditional Greek soup, which requires eggs and lemons for its consistency and lively taste. While it is generally chicken-based, recipes sometimes call for vegetarian stock or other meat broths. 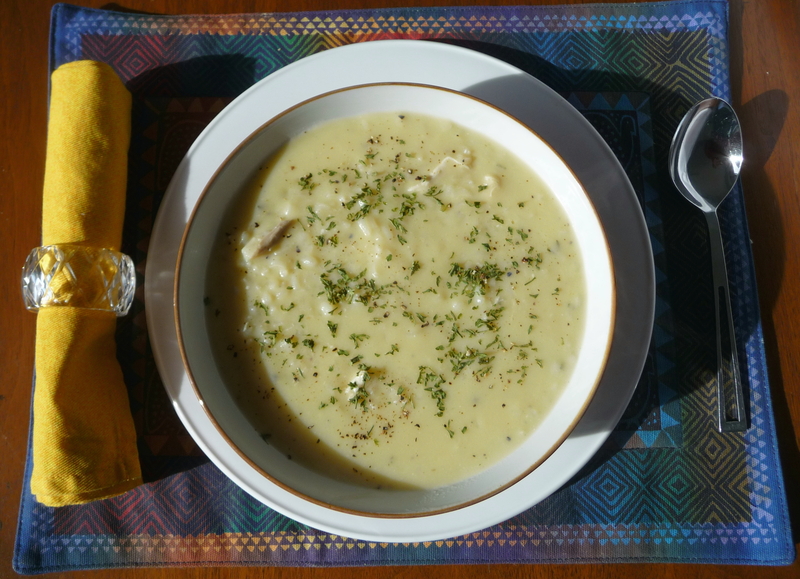 NB: I do not agree with the Wikipedia entry for avgolemono soup “invariably” curdling, when refrigerated and reheated; I have not had this happen to me. I have fond memories of avgolemeno soup from living in “Chicagoland”. Greater Chicago had such an influx of immigrants in the 19th and 20th centuries that it would make such claims as more Poles than anywhere in the world except for Warsaw and more Greeks than any place outside Athens. There were many outstanding Greek restaurants throughout Chicago, as well as diners, coffee shops, and other such American-style restaurants run by people of Greek descent. As my family ate out many times each week while I was growing up, we often had Greek cuisine in “Greektown” as well as eating in Greek-influenced diners. Avgolemeno (“egg-lemon”) soup was frequently on the menu in the former and the latter, with the name always in English at the diners. Except during my strictest vegetarian years, I always enjoyed avgolemono soup. 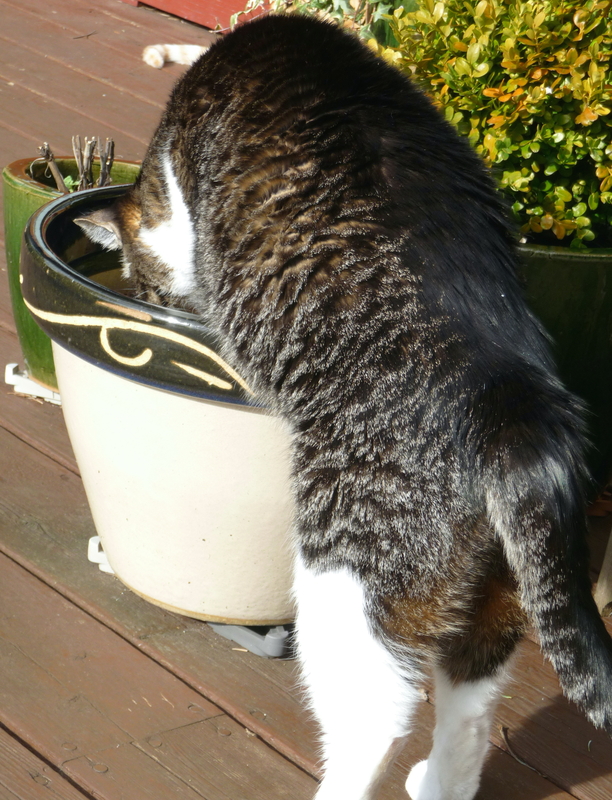 George seems to be pondering when spring will arrive. Any sprouts coming up yet? 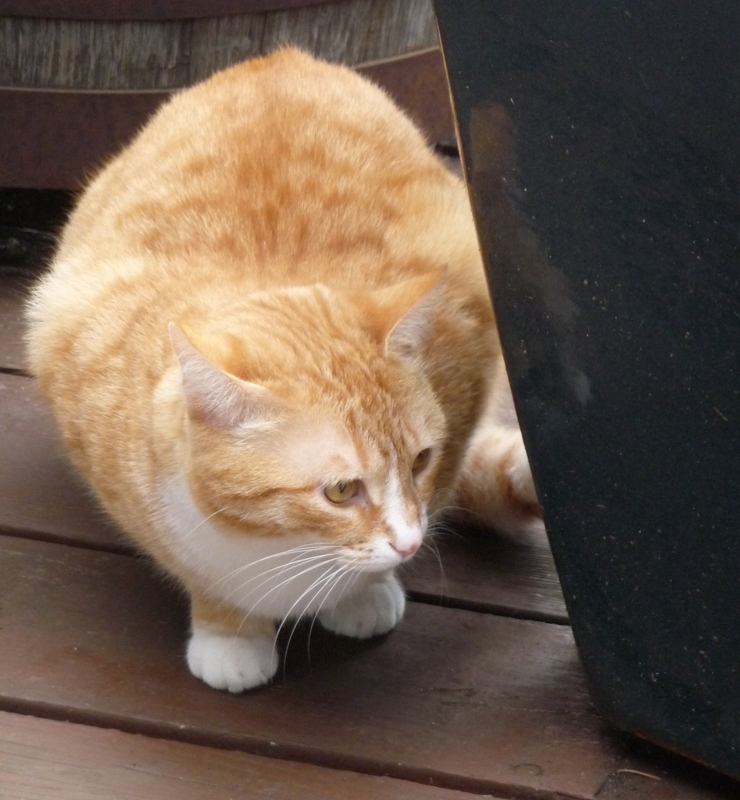 Jinja may be looking around the corner for spring…. 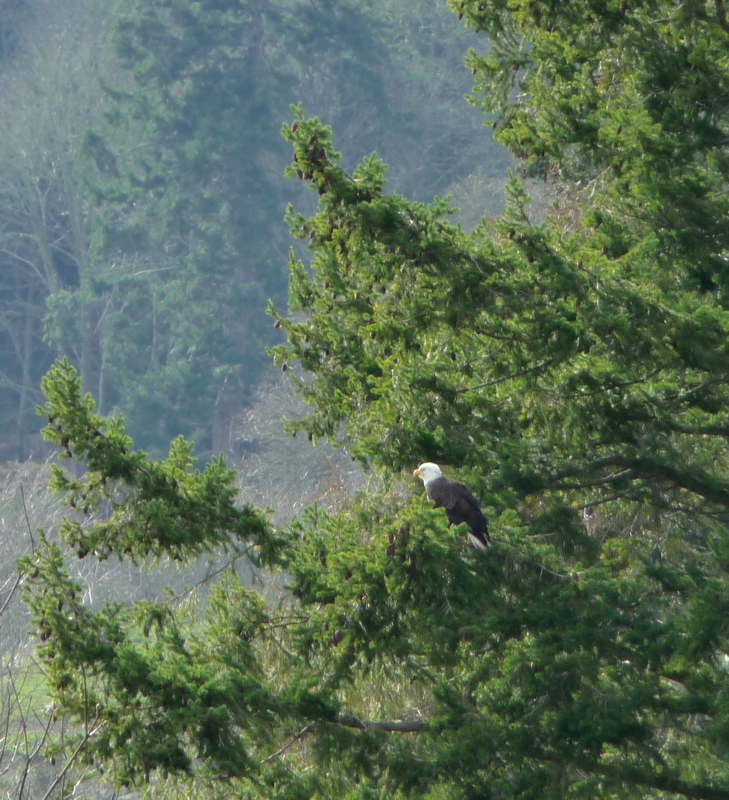 While a bald eagle appears to be contemplating spring nest locations. Though I follow the traditional chicken-based version, a vegetarian alternative – though not vegan – could work well. The thickening of the eggs, I suspect, could not be readily replaced by vegan alternatives with the same results. Similarly, brown rice could work, but I believe the creaminess of white rice contributes to the texture (I generally use Basmati or jasmine rice in this soup). Black pepper is a key star, along with the sassy lemon. Lemon-chicken-pepper are natural allies, so they shine together in this soup. The thick luxurious texture and rich taste belie the relative low-fat nature of the soup and its easy preparation. If there is leftover white rice in your fridge, this soup can be ready in fewer than 15 minutes – making good use of the rice. As is, this soup is substantial enough as a main course, with a hearty bread – try a good sourdough, with its tanginess to complement the lemony soup. Perhaps a Greek salad and/or a spanakopita, spinach-feta filo pie, could accompany the soup for a Grecian feast? So if you are not taking a winter fantasy/get-away to the Greek Isles like Shirley Valentine, this soup is the easiest way to transport yourself to sunnier, warmer climes. Prepare rice according to directions for that particular rice, if making fresh rice, one-half hour before you would like to serve the soup. Heat stock in a large sauce pan. Add fresh rice or left over rice to stock and stir to combine. Whisk the eggs with the lemon juice in a heat-proof glass or ceramic (i.e., non-reactive) bowl. Add about one-cup of hot broth into the egg-lemon mixture very slowly in a steady thin stream to temper the eggs (that is, to ensure they do not curdle), stirring constantly with a whisk or large wooden spoon. Gradually whisk in more broth until the egg mixture is well-heated, approximately another cup. Pour the egg-lemon broth mixture back into the pot, whisking or stirring to combine briskly. The result should be a creamy, opaque soup. Taste and add salt and plenty of pepper (more lemon juice at this point, if you want it to be really lemony). If you have leftover chicken, add pieces of chicken to the soup before serving. This entry was posted in Recipes Misc, Soups and tagged Brunch, Chicken, easy, Egg, Greek, lemon, Recipe, soup. Bookmark the permalink. There once was a restaurant, in my hometown that made this soup. I’ve always wanted to replicate it. I think your recipe could just be it. So glad you shared it. We’re waiting for Spring, too. Would you believe snow is predicted on my part of the Central Coast of California??!! This hasn’t happened in 35 years!! Thanks, Debby. I bet you’ll like this soup, which seems much more decadent than the simple ingredients indicate. Who knew that Monterey would not be basking in spring sunshine now?!? I have never heard of avgolemeno soup before, it sounds so intriguing. I think I would like the addition of the chicken. Yummy. I always enjoy seeing pictures of your cats. 🙂 I have just started the process of getting the 2 that “adopted” us here in Mauritius back home to South Africa. 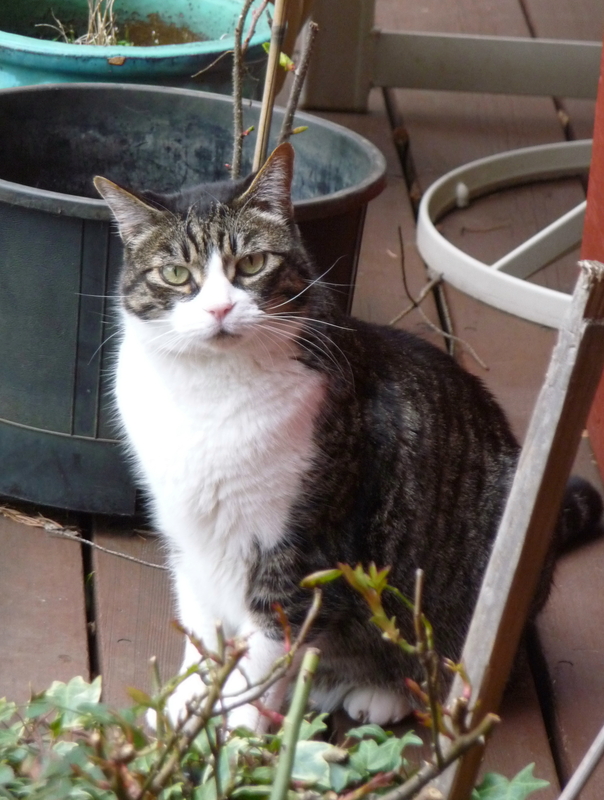 I am extremely nervous about introducing them to our cat at home, she is an old girl (11) and has been on her own her whole life and bringing 2 energetic young ones into her home might take some getting used to. Here’s hoping for a smooth transition. Hi, Mandy. This is one of the great chicken soups of the world, in my view, and the flavour is surprising for its simplicity. Try it! I do hope all goes well with your cat introductions – it all depends on space at home and just how territorial the resident feline is (or how many places there are for hiding…). This totally looks like something I could get behind, only… the rice. Sigh. When I had the Swine last year I tried to eat some soup which had rice in it and it made me feel so violently ill I’ve gone off the idea of having rice in any kind of liquid. Only white rice, though. Maybe it’s time to embrace it and learn to love it again…? Hi, Jax. I hope you’re enjoying your travels and feeling better – wherever you may be right now. I hope you aren’t forsaking congee and all other rice-soups now. You have to overcome your swine-induced-soupy-rice aversion. You can do it! I have heard of this soup but have never tried it. The Greek community isn’t that large in Southern California so Greek food wasn’t as easy to get. I read somewhere that the largest Greek community outside of Athens was in Melbourne, Australia. Thanks, KM. Maybe it’s not the best soup for a steamy tropical climate…. I know that Melbourne has a huge Greek community, as well as a sizable Lebanese one, so I wonder if the Chicago claim is out-of-date – very different immigration realities over the course of the past century or so (as in, why would a sensible Greek choose a city with snow and bad coffee – at least until two decades ago – when he/she can live in Melbourne?). The word must have gotten out! I love Avgolemeno! Have you ever tried it with orzo, instead of rice? I’ve made it both ways, although I prefer it with rice. It sounds perfect for yet another cold, snowy SoDak day! Hi, Rachel. I think orzo would work well, too, though it wouldn’t have the creaminess of the white rice – and is not so traditional. But it would add a chewy consistency to your life in frozen SoDak. Salut, Pierre. C’est une bonne soupe, facile a preparer en hiver en France ou n’importe ou. I’ve never heard of this soup before. Does it require a specific variety of rice, maybe Arborio? It seems very similar to a Vietnamese rice porridge soup called chao ga. Thanks, Jackie. I think it’s not too dissimilar to jok or congee, too, though the lemon flavour predominates in this one. I use jasmine or basmati typically, though Arborio or canaroli would work, too, for an even creamier rice experience. This is one of my husband favorite soups so i have to make it at least once a month 🙂 but he likes lots of lemons so i have about 4-5 lemons in there. I like it too but not as much as he does. It is usually gone in a few days. But as you said a GREAT soup. It’s warm and filling and so simple to make but with all the lemon it feels so refreshing. 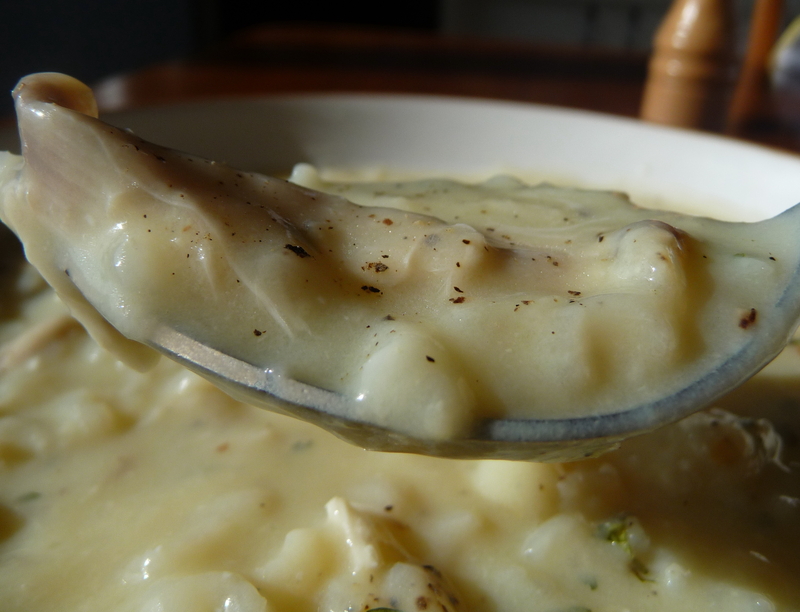 We always add the rice as we serve cause othewise if you leave the soup out and have left over it become too mushy. And if you have left over stock cook the rice in the stock – great flavor addition. Thanks, Ewa. Your husband’s version sounds like lemon-overkill, though I’m a big citrus fan as well. You’re right about the rice, especially varieties which tend to swell more, but I fully cook my jasmine, which works well. I’ve been a fan of this lovely Greek soup since a friend of mine first made it. Oddly enough, I have yet to recreate it in my own kitchen. But, this will be a quiet weekend for me, so I think I’ll take the plunge. Thanks, Marysol. Once you see just how easy it is to make this soup, you’ll ask yourself why you didn’t try it earlier at home (a bit more complicated if you start with home-made chicken stock but so simple with good store-bought). I grew up in Minnesota, and the earliest and most “ethnic” restaurant my parents took me to was a Greek restaurant and by far my most favorite part of the meal was the bowl of Avgolemono soup. To this day, I start to salivate just thinking about it. Your recipe is on the short list of must have soons. Thanks, Louann. I never thought of this soup as a “taste of Minnesota” – but that is your association. It would have been perfect for those brutal winters, though chilly Bay-area days could stand a soul-warming soup like this one. I have never had this soup before, but after reading your description…I’m IN. I have been on quite a lemon kick anyway and am looking for new soup recipes. It’s finally warming up here in So Cal but a sunny lemon soup sounds like just the thing for one of these late winter/early spring days. Hi, Geni. What with your Greek heritage, you must try this (and use up all the lemons hanging from all your trees at home). I’d love to learn how to make baklava, so you must do the post – I have wanted to try it at home and have some recipes, but I bet your tips are helpful. It’s been a while you did not post !! Hello, I made this tonight and it was wonderful! It was perfectly lemony and the eggs did not curdle, unlike my previous attempts to make avgolemono. =) I think the key is to use room temperature eggs and lemon juice, and to use a hand mixer to beat the eggs while adding the hot broth, and while adding the egg and broth mixture back into the rest of the broth. I should have let the soup heat up a bit more so it thickened a bit more, but I will make sure to do this next time! thing like this before. So great to discover somebody with some original thoughts on this subject matter.